The bluetick coonhound is a mild-mannered yet energetic hound dog of medium to large size. This breed is smart and has a friendly, loyal disposition. Easily recognized for its beautiful and unique pattern and color, this hard-working hound is well-suited to both hunting and companionship. Though the bluetick coonhound is ideal for hunting small game, you don't need to be a hunter to own one. However, this breed belongs in an active home where there is plenty of access to explore the outdoors. Bluetick coonhounds can be wonderful companions and great family dogs when properly trained and socialized. Coat and Color: Short, sleek, and shiny coat in dark blue with a thickly mottled body; black spots on back, ears, and sides; may have tan markings. 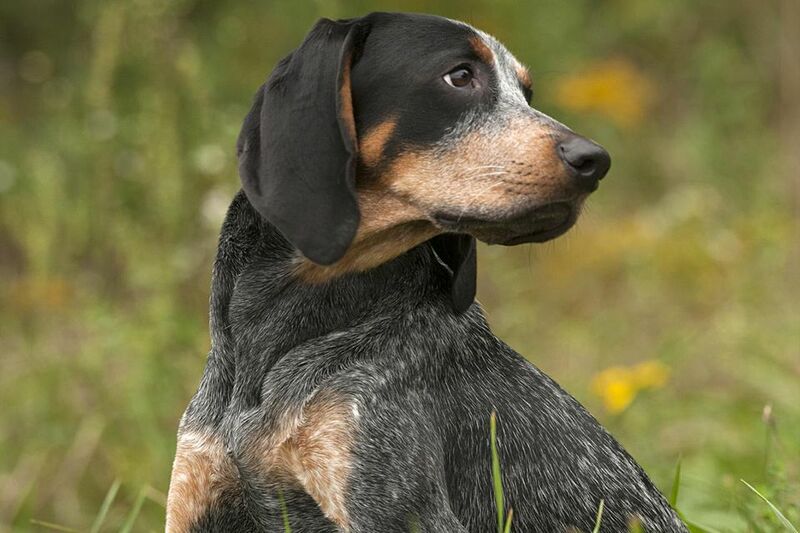 The bluetick coonhound is an American breed that dates back to colonial times. This hound most likely originated from the crossing of various American hounds with European hounds such as the grand bleu de Gascogne (French Staghound) and the English foxhound. The bluetick coonhound was originally called the English coonhound, but this name was changed in 1946. The breed has been recognized by other kennel clubs like the United Kennel Club for decades, but the bluetick coonhound was not officially accepted into the AKC Hound group until 2009. The Bluetick coonhound has a short, smooth coat with a fairly low rate of shedding. Routine basic grooming is all that is typically necessary to keep your bluetick looking his best. Like all breeds with long floppy ears, it is important to keep the ears clean and dry in order to prevent ear infections. Although active dogs may naturally wear down their toenails, it's important that your check the feet regularly. Trim the nails as needed so your hound's feet will stay healthy and comfortable. They also can have a musty scent and you will want to give a coonhound a bath regularly. The bluetick is a very intelligent dog that sometimes shows a stubborn side. Proper training is an absolute necessity in order to give your dog structure, but they can be a challenge to train and may not be appropriate for those new to dog training. Training will also help strengthen the bond between you and your dog. Socialization is equally important. Blueticks tend to get along very well with children and other dogs. However, they have a very high prey drive and are hard-wired to chase raccoons and other small animals. Extra care should be taken to socialize your dog to cats and other small animals. If the two are to share a household, the bluetick should ideally be raised from puppyhood with the cat. Blueticks are also known for their voices—like most hounds, they bay. Some find the Bluetick's bay rather sweet and song-like, while others can be quite annoyed by it. This breed has loads of energy and can easily become bored, so adequate exercise is essential. Bluetick coonhounds should be kept on a leash or in a fenced-in area and not permitted to roam free. Once they catch a scent, they will follow it. With a strong desire to hunt, this hound can get pretty far very fast. They can be escape artists and will set off with wanderlust once they figure out how to get out. Allowing them to run in a securely fenced yard helps burn off some energy. They behave well indoors, often just lounging around and enjoying your company. But they are not well-suited to apartment living because they need some outdoor space in which to run around regularly. Their loud voices also may not be appreciated by close neighbors. Bluetick coonhounds may do better in a household with another dog to keep him company. It's also best if you are at home enough to give your dog attention. They will not do well simply left alone in a yard all day. While bluetick coonhounds are friendly, they can be almost aggressively so with visitors, greeting them with a howl and sniffing them thoroughly. They are unlikely to bite, however. These dogs do well in a variety of climates, with moderate toleration of both cold and hot weather. Hip dysplasia: This is an inherited condition that can lead to lameness and arthritis. Ear infections (otitis): Proper ear care is essential. Bloat: Eating and drinking too fast can produce gas. If the stomach becomes twisted, the blood supply is cut off and it becomes an emergency medical situation. A bluetick coonhound will need about 2.5 cups of dry dog food per day. If your dog gulps his food, it's best to give two smaller meals per day and look into feeding systems that slow the delivery of food. Be sure to monitor your pet to see whether he is gaining weight. Obesity can shorten a dog's lifespan and put him at risk for other conditions. Discuss an overweight dog with your veterinarian to get recommendations for a feeding schedule, food amount, dog food type, and exercise needs. Locating a good breeder is essential to finding the right puppy. The AKC marketplace provides links to breeders who post available puppies and updates on when they expect litters. The AKC also maintains a list of national rescue groups. As with any breed, if you think the bluetick coonhound is right for you, be sure to do more research before you decide to get one. Get opinions from veterinarians and pet professionals. Talk to other bluetick coonhound owners, reputable breeders, and hound rescue groups to learn more. Explore our many dog breed profiles to find the right companion to bring home.